Gallow Green is a rooftop gem atop The McKittrick Hotel in the Chelsea section of Manhattan. According to their website, the hotel was completed in 1939, The McKittrick Hotel was intended to be New York City’s finest and most decadent luxury hotel of its time. Six weeks before opening, and two days after the outbreak of World War II, the legendary hotel was condemned and left locked, permanently sealed from the public. We celebrated Gia’s birthday. She and I have been friends for over 30 years. It always means a lot to me to be present for my friends especially since I have so few. Being surrounded by empowered women, some who I love wholeheartedly, made my time at Gallow Green especially wonderful. I enjoyed the lamb meatballs made with chick peas, pecorino, ricotta and mint. The meatballs were full of flavor and full in size. I also enjoyed their fingerling potatoes roasted in duck fat. The crisped outer skin of the potato with the soft, almost creamy, flesh is exactly how I envisioned it. I requested a side of their curry mayo which turned out to be the perfect complement to an already delightful dish. To cap it all off, we enjoyed their strawberry shortcake – a moist, warm biscuit topped with fresh, tart strawberries and lightly sweetened whipped cream. I ordered 3 Forgotten Summers at $17.00 a glass. This refreshing cocktail is made with crop vodka and hiro sake with basil shiso and topped with ginger beer. I asked them to exclude the basil. The cocktail is undoubtedly refreshing. It was exactly what I needed to keep cool during a summer night on a rooftop in NYC. 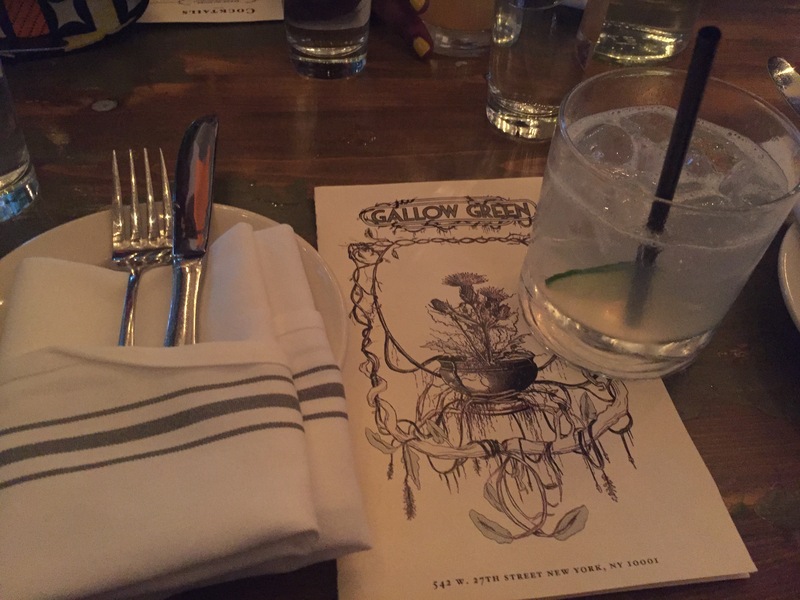 Gallow Green’s ambiance is uniquely set. I love the decorative railroad tracks that lead to an overlook; a whimsical touch with a romantic twist. Gallow Green is at the top of the list for NYC’s rooftop gardens. It is definitely a must visit! Categories: Dining Out, Food and Wine, Food Wine and Spirits, Leisure, Love and Relationships, Miss Metropolitan Junkie, Uncategorized, Urban Aristocrats, What's Hot in N.Y.C.